There have been some amazing Gable Tops popping up around the internet lately, and today I wanted to share some of the ones I've found. There are lots of stripes (naturally!) and some jaw-dropping creativity - I'm forever amazed at the never ending interpretations the Sewing Community comes up with to make a pattern their own. 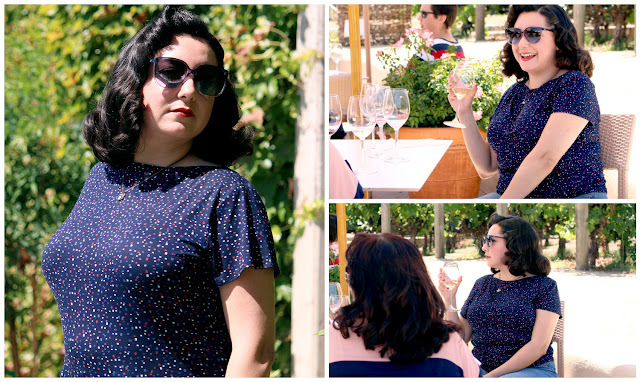 Bianca made the short-sleeved version of Gable and then went off to sip wine while looking effortlessly chic in her Gable top. She even made a little video talking about her experiences with the pattern, so if you want to see the top in action, make sure you check it out! Abi read my mind when she turned The Gable Top into a dress! There's a little expansion pack for that coming, BUT, doesn't she look gorgeous? 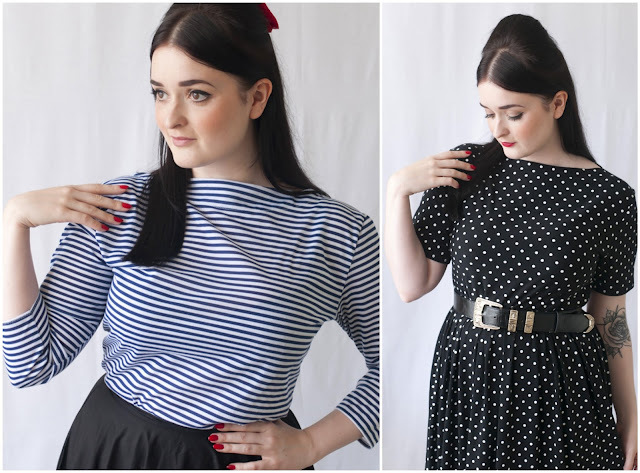 She also went for a 3/4 sleeve option for her top and slightly lengthened the short sleeves on the dress - love the retro-vibe of these little adjustments. 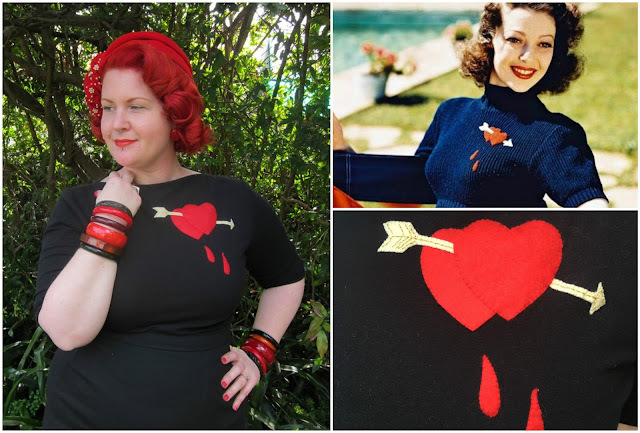 Bex made the most amazing Gable Top using Loretta Young's Bleeding Heart top as inspiration - when I first saw this, my jaw dropped. I have a plain black Gable that I'm seriously considering giving a make over a` la Bex, it's such an easy way to make a unique garment. 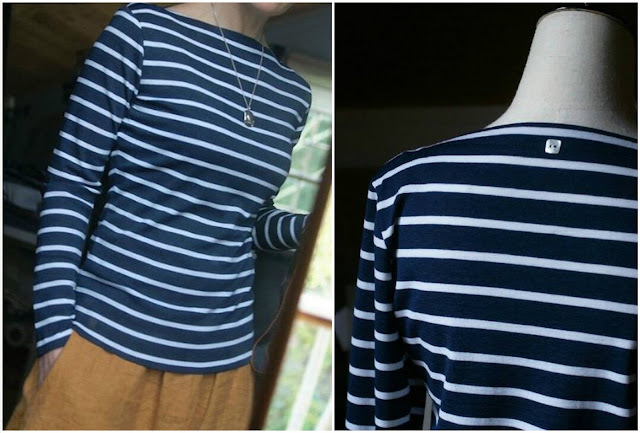 Emma went for casual elegance and graded up her Gable Top for a more relaxed fit. Perfect for the lazy days of summer ahead that we're both looking forward to. I need a breezy Gable in my life I think - it'd be perfect for a spot of gardening. And that beautiful little shell button to mark the back? Genius. Oh the colour! I'm not quite sure what Jen chose to make her Gable Top with, but I'm imagining it being a perfectly squishy and soft merino. 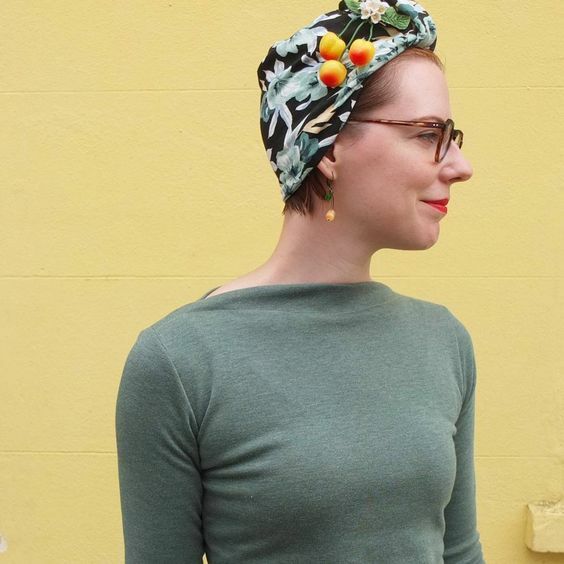 And I'm so very much wishing I could get away with wearing a turban with fruit on it - a perfectly subtle nod to Carmen Miranda and such a lovely way to style Gable, casual yet elegant with a cherry on top. Lauren is the first person I've seen make View 3 with the long cuffs and I absolutely adore the contrast fabric she used here. 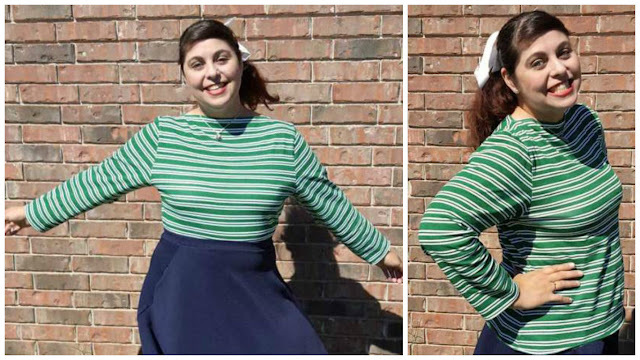 If you're not into the retro-look, Lauren's Gable Top just goes to show how easily you can make it instantly modern. Doesn't Akram look so happy in her Gable Top!? Maybe that's because she looks adorable, especially teamed with that skirt. She reminds me a little bit of Sandy at the beginning of Grease, right? 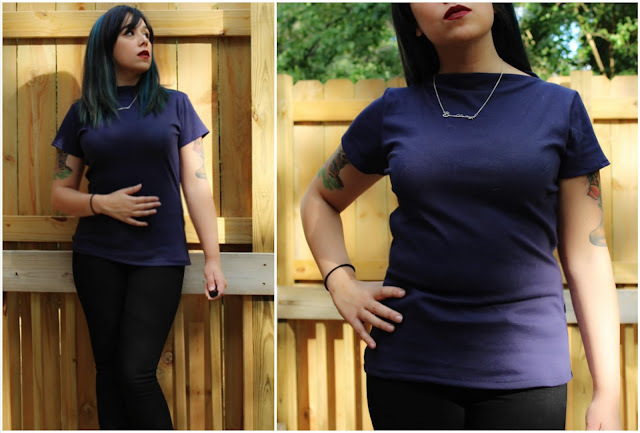 Ashley went for classic navy and short sleeves for her Gable Top. A perfect mid-season transitional piece that you can wear during the warm end-of-summer days and then layered with a cardigan for those cool nights. And let's face it, navy goes with everything, so there's always something comfy yet classic to wear. 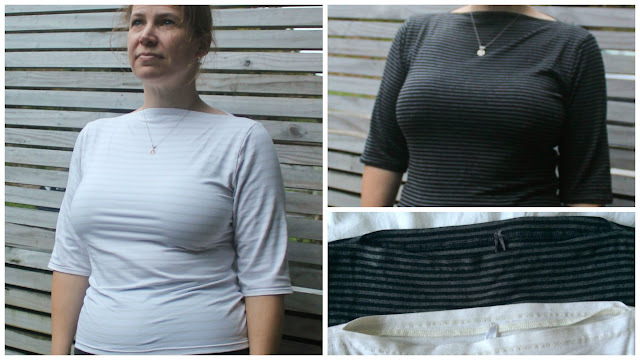 I've made a fair few striped Gable tops in my time, but I love the stripes on the fabric Shanni used for her's. 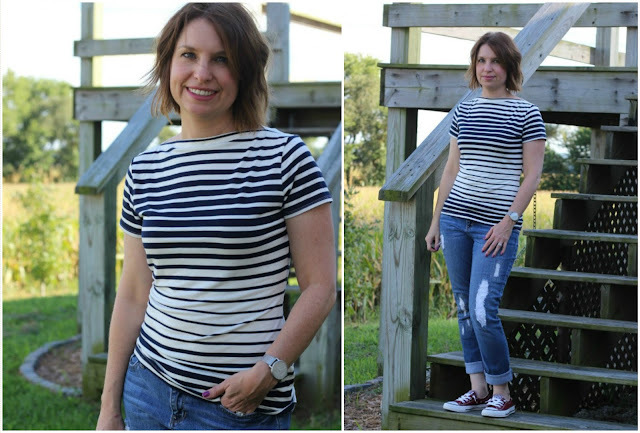 Then, simply pair your striped Gable with some distressed denim and converse and you're good to go for a casual afternoon stroll . Barbara was another of my amazing testers, and again, we have stripes. No one can resist! 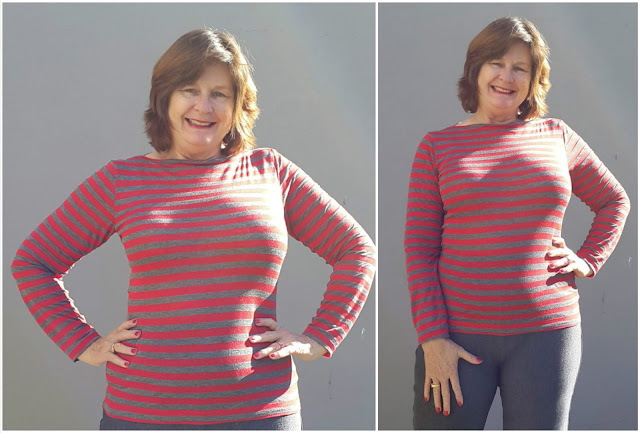 And Barbara's Gable is another great example of how easy the pattern is to modernise if you're not a vintage girl - a classic red and grey striped fabric is all you need. Phew, so many great Gable Tops, right? If you like to be included in future JLH Pattern Round Up's, just flick me an email or tag me on instagram! Coming up next, how to make that easy little 3/4 sleeve adjustment to your Gable Top. 2 comments on "A Gable Top Round Up"
These are fab indeed. Adding it to my queue!